An analysis of federal payment records found that the government is still making monthly payments to relatives of Civil War veterans – 148 years after the conflict ended. OLYMPIA, Wash. — If history is any judge, the U.S. government will be paying for the Iraq and Afghanistan wars for the next century as service members and their families grapple with the sacrifices of combat. An Associated Press analysis of federal payment records found that the government is still making monthly payments to relatives of Civil War veterans – 148 years after the conflict ended. The new veterans are filing for disabilities at historic rates, with about 45 percent of those from Iraq and Afghanistan seeking compensation for injuries. Many are seeking compensation for a variety of ailments at once. Experts see a variety of factors driving that surge, including a bad economy that’s led more jobless veterans to seek the financial benefits they’ve earned, troops who survive wounds of war and more awareness about head trauma and mental health. It’s been 40 years since the U.S. ended its involvement in the Vietnam War, and yet payments for the conflict are still rising. Now above $22 billion annually, Vietnam compensation costs are roughly twice the size of the FBI’s annual budget. And while many disabled Vietnam vets have been compensated for post-traumatic stress disorder, hearing loss or general wounds, other ailments are positioning the war to have large costs even after veterans die. Based on an uncertain link to the defoliant Agent Orange that was used in Vietnam, federal officials approved diabetes a decade ago as an ailment that qualifies for cash compensation — and it is now the most compensated ailment for Vietnam vets. The VA also recently included heart disease among the Vietnam medical issues that qualify, and the agency is seeing thousands of new claims for that issue. Simpson said he has a lot of concerns about the government agreeing to automatically compensate for those diseases. “That has been terribly abused,” Simpson said. Since heart disease is common among older Americans and is the nation’s leading cause of death, the future deaths of thousands of Vietnam veterans could be linked to their service and their benefits passed along to survivors. Of the 2,289 survivors drawing cash linked to WWI, about one-third are spouses and dozens of them are over 100 years in age. Some of the other recipients are curious: Forty-seven of the spouses are under the age of 80, meaning they weren’t born until years after the war ended. Many of those women were in their 20s and 30s when their aging spouses died in the 1960s and 1970s, and they’ve been drawing the monthly payments since. Surviving spouses can qualify for lifetime benefits when troops from current wars have a service-linked death. Children under the age of 18 can also qualify, and those benefits are extended for a lifetime if the person is permanently incapable of self-support due to a disability before the age of 18. Citing privacy, officials did not disclose the names of the two children getting the Civil War benefits. Their ages suggest the one in Tennessee was born around 1920 and the North Carolina survivor was born around 1930. A veteran who was young during the Civil War would likely have been roughly 70 or 80 years old when the two people were born. That’s not unheard of. 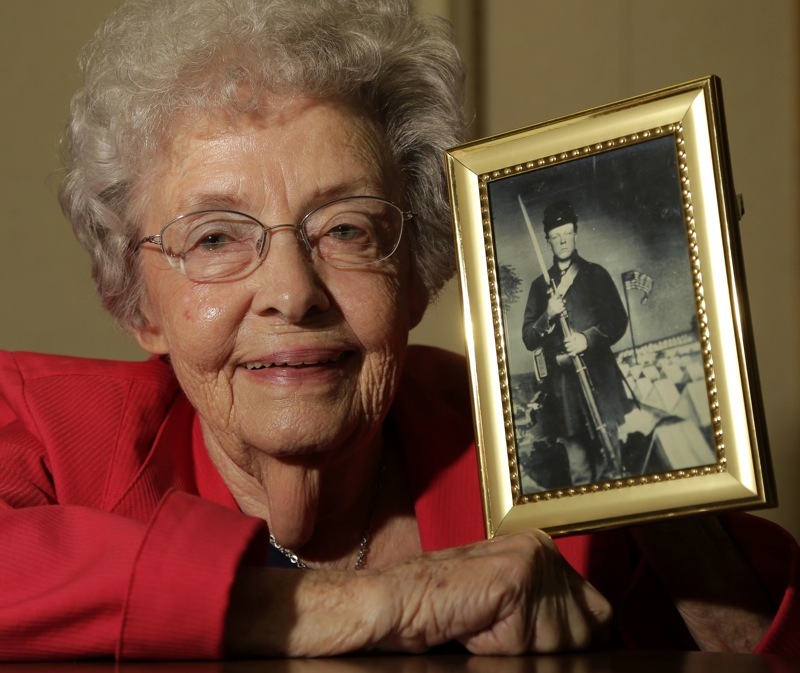 At age 86, Juanita Tudor Lowrey is the daughter of a Civil War veteran. Her father, Hugh Tudor, fought in the Union army. After his first wife died, Tudor was 73 when he remarried her 33-year-old mother in 1920. Lowrey was born in 1926. Lowrey, who lives in Kearney, Mo., suspects the marriage might have been one of convenience, with her father looking for a housekeeper and her mother looking for some security. He died a couple years after she was born, and Lowrey received pension benefits until she was 18. Now, Lowrey said, she usually gets skepticism from people after she tells them she’s a daughter of a Civil War veteran. “We’re few and far between,” Lowrey said.